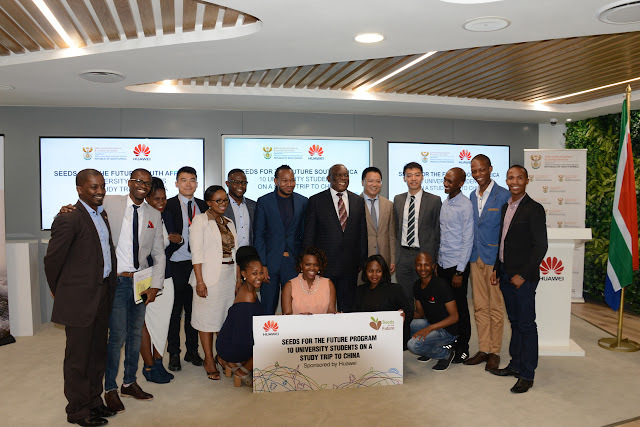 Leading ICT Solutions provider, Huawei, celebrated the send-off ceremony of their first Seeds for the Future students from South Africa, in partnership with the Department of Telecommunication’s and Postal Services (DTPS). The training opportunity has been awarded to 10 South African students who will receive international training through Huawei’s program in Beijing and Shenzhen, China. No one can say for sure what the future information society will be like. Huawei remains optimistic by bringing together young people of different cultures and backgrounds. Several years from now, they will unleash their potential and contribute to global progress. “Huawei is committed to doing its part to shape the future. This is our most heavily invested CSR activity, and we will continue to invest in the program over the long term.” added Mr. Hu. Through the Seeds for the Future program, Huawei seeks to arrange for students to study cutting-edge technologies such as 5G, LTE, and cloud computing, and offer those opportunities for hands-on practice in Huawei's most advanced labs. Also, this will help them learn more about Chinese culture and gain cross-cultural work experience in a global business environment. What makes this program unique is that it also offers first-hand learning opportunities through interaction with Huawei staff and visits to Huawei laboratories, where program participants can engage in hands-on practice and witness live demonstrations of the latest ICT technology. The learners are from the Tshwane University of Technology, Central University of Technology, Nelson Mandela Metropolitan University, Cape Peninsular University of Technology and the Durban University of Technology. They are third year or B-Tech students in Communications Networks, Information Technology, Software Development and Business Applications.Some African countries that have been part of the initiative include, Kenya Namibia, Botswana, Nigeria, Zimbabwe and Ghana.